The Pepper event was a great success! For a Yale Daily News article about the address, click here. 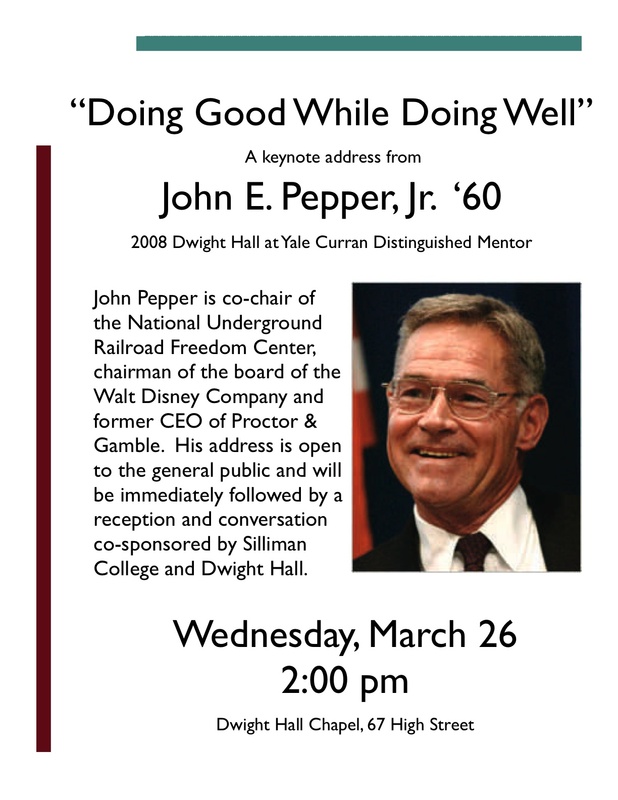 John E. Pepper, Jr. '60 will deliver a keynote address to the Yale and New Haven communities as Dwight Hall's Third Curran Distinguished Mentor at 2:00pm on Wednesday, March 26. The event is open to the general public and will be immediately followed by a reception co-sponsored by Silliman College in the Dwight Hall Library. The theme of the talk is "Doing good while doing well". As part of his two-day visit, which will also include small group meetings with Dwight Hall student member organizations and a dinner with Dwight Hall leadership, Pepper will publicly address the Yale and New Haven communities in Dwight Hall Chapel. Pepper's wealth of experience makes his address relevant to students and others with diverse interests from different walks of life. Following his successful 39-year career at Proctor & Gamble, where he filled various positions including chief executive officer, Pepper is the current chairman of the board of The Walt Disney Company. He is the former Yale vice president of finance and administration and the current co-chair of the National Underground Railroad Freedom Center, a museum in downtown Cincinnati that aims to inspire action to defend freedom today. He has been consistently active in public service and social justice issues, helping found the nationally acclaimed Cincinnati Youth Collaborative in the late 1980s and chairing the 1994 Greater Cincinnati United Way campaign. According to Pepper himself, the event is relevant for everybody. "No matter what ones career is," he says, "there is a role that you can and must play in social and public policy." The Curran Distinguished Mentor program was generously endowed by William Curran '49 in memory of his wife, Jane. The program aims to provide students access to role models who embody Dwight Hall's mission in their professional lives. Past Distinguished Mentors include former Mayor of Baltimore Kurt Schmoke '71 and Natural Resources Defense Council (NRDC) President Frances Beinecke '71. For a description of the event on Yale Bulletin & Calendar, click here. For a recent Yale Daily News artlice about Pepper, click here. For a PDF file of Dwight Hall's Spring '06 Newsletter with information about the Curran Distinguished Mentor Program, click here.